Tips and stuff I've learnt over the years, hope you find them useful. All resources here can be used in your own art for learning purposes, you do not need to credit me. You don't know how much I love you for all that tutorial <3 thx a lot !! 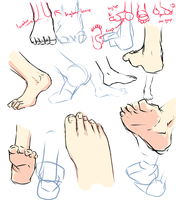 I use your tutorials very often though I must ask if you have any tutorials for feet because its very difficult for me to find leg tutorials without awkwardly looking at the rest of the lower body That and searching foot tutorial can get weird results online. I found a foot tutorial... hope it might help what you're seeking! Thanks for the tutorials! They're great! Your anatomy tutorials are awesome~ They're good for referencing.